INPUT OUTPUT: 2013 "The Year of Blaire"
2013 "The Year of Blaire"
The following is a write up by Blaire Kniaziew Gervais. For those that don't know, 2013 has been dubbed "The Year of Blaire" because Blaire and I have decided to take turns each year who gets to take full priority over the other in terms of training and racing. Having a young son means that we are not able to (both) train like we used to. This has been our simple solution. We'll see how "simple" Blaire thinks it is during "The Year of Matt!" What a year it was! The main goal for 2013 was simply to get back into triathlons. 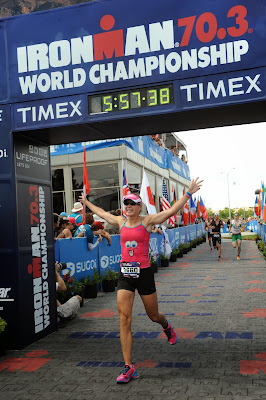 I have been doing tri’s since I was very young, but after having a child, I took a three year hiatus from the sport. I was both excited and nervous to get back into it. Matt and I had set the goal in December of doing a half ironman as my “A” race for the year. Goals for the year were somewhat vague, because there hadn’t been any major tests to my fitness and ability for a few years, but I definitely wanted to be competitive and also had hoped to have a shot at qualifying for the World Champs in Vegas. We had also set the New York Marathon as a late season goal, but more just as a “bucket list” kind of race, not really with any specific time goals in mind. December 2012, Matt and I signed up for the Calgary 70.3, which was my “A” race for my comeback year. The goal was to get a few road races under my belt in the early Spring, then do the Ann Arbor triathlon as a tune up before my “A” race in July. Due to poor weather, Ann Arbor was cancelled. This meant that I would be going into Calgary 70.3 as my first triathlon since I raced Hawaii in October of 2009 (3.5 years). I was both excited and scared. I knew that I was well prepared with the help of Input Output coaching and I was feeling strong. I was racing well in the Thursday night Ciociaro Race Series for the first time and my run times were really coming down, but without any kind of triathlon test prior to race day, I didn’t really know what to expect. Just a little side note... I think I am most proud of this season because of the struggles I had coming back from child birth. I was unable to lose any weight and wanted to quit sports all together in June of 2011. After having several melt downs, Matt and I decided it would be best if I joined weight watchers to try and get back to my pre pregnancy weight. It worked! With the weight loss, I gained motivation and fitness. Calgary was an awesome race! I was the second amateur out of the water, 6th fastest amateur on the bike, and 4th fastest amateur on the run. These splits got me across the line as the first female amateur in the race and 8th overall! I guess some things in life you just don’t forget how to do. I was thrilled with my result and motivated for my next challenge. My performance in Calgary qualified me for the World 70.3 Championships in Vegas so I was very excited to see how I could do against the top age groupers in the World. Some of my season highlights include PB’s in the 5km (18:44), ½ Marathon (1:23:15 in Detroit) and the Marathon (3:02:24 in New York). Also winning the bronze medal at the World 70.3 Championships in Las Vegas was something I will never forget. I went undefeated from April to September. The key to my most successful season ever as an athlete was focused and structured training. I was only putting in an average of 10 hours a week training for the year, with a peak week of 17 hours (swimming 1-2 times, biking 2-3 times and running 3 times). Thanks to Matt and Input Output Coaching, I always made each workout count. Juggling work, family and training is not easy so when it was time to workout, I worked hard and made it count. I also realized that I can’t train like my competition because I don’t have the time or energy. Matt kept me focused and made sure my training was always 100% specific in order to reach my goals. The “Year of Blaire” was outstanding for me and I performed far beyond my expectations. I have some run focused goals for 2014, but I’m really looking forward to cheering Matt on in the “Year of Matt.” When 2015 rolls around, we will have some major goals in mind and we don’t plan on slowing down any.